Dark Aged Copper 5" Floating House Number - - made of solid cast brass. Attach directly to a wall to display your address in elegant style. Please select the numerals desired (one at a time) in the designated box. If you need multiples of a particular numeral, please use the quantity box. 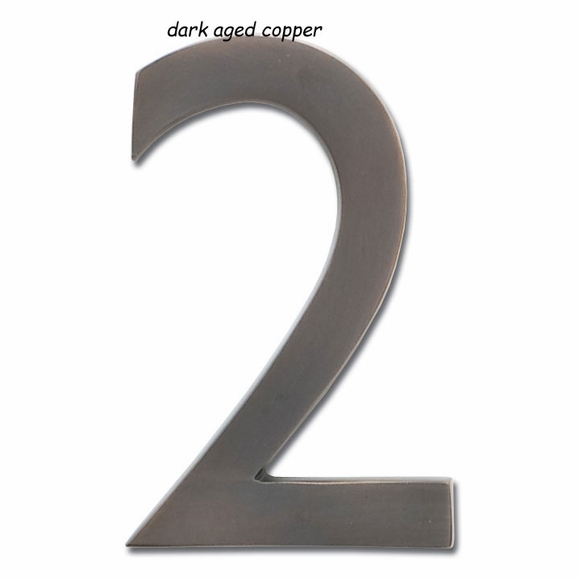 In addition to dark aged copper, the 5" floating number comes in these other finishes: antique pewter, polished brass, black, antique brass, antique copper, and satin nickel. If the numbers you need are not available in dark aged copper, you might want to check current availability in the other finishes (see Related Products).